Each 2.5″ X 3.5″ art card, Copics, fine liners, gel pen. Some more cards from the online Fairytale art-a-thon I mentioned last time, and submitted to the Illustration Friday topic, “Tribute”. These three dogs were inspired by a story from one of those large McCall’s Storybooks from the 60’s. In the story are the dog with eyes as big as saucers, the one with eyes as big as dinner plates, and the one with eyes as big as wagon wheels. Then someone told me about an earlier story featuring the dogs, The Tinderbox, by Hans Christian Andersen – though instead of wagon wheels, the largest dog had eyes as big as windmills! The original story is a Scandinavian folktale. I’m rather fond of the Llama Girl in the bottom left. Thanks for visiting! This entry was posted in Art Card Dogs, ATCs and ACEOs, Copic Markers, Progression Photos on May 4, 2013 by The Beast Tender. Oohhh, those puppy dog eyes are sooooo adorable! Love the close-ups! I like the purple dog the best. Such sad eyes. My fave is the green dog. Love the patterns on the dogs’ noses. Your dog eyes are fantastic! I love llama girl, she looks so cool. Another batch of fabulous art. OMG! I love the dog eye cards!!!!! They speak! Oh those doggy eyes, so very endearing.Interesting forest people too. A good direction. Looking forward to more! What big & sad eyed pups but adorable-hope you had fun with the swaps!! Love,Mom PS We had to leave the house twice today-someone love it & wanted to come back to take photos & people are more @ ease when the owners aren’t @ home. We also found something we “fell in love with yesterday” but it has to wait until this one is a done deal! Great work! Love all the little details! The eyes have it! Such wonderful work Cindy. Llama girl has a lot of personality – love it! Always so great to check in and see your colorful, vivid and creative work..you always amaze me! Your imagination is pretty amazing. And, as for the tribute–those big eyes say it all! WOW! Love love love the forest folks…..the colors, the concept, and creativity. 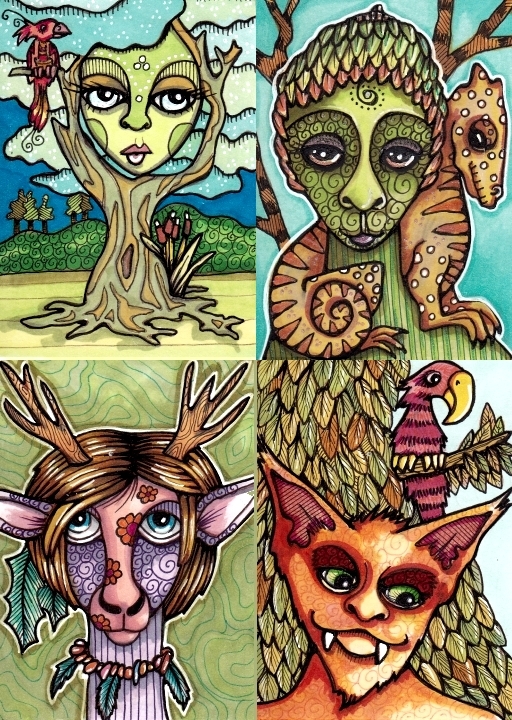 They totally belong in a storybook…..I can imagine a woodsy folklore for each character. And three dog eyes are wonderful too. Your eyes are getting more and more refined. They seem to pop! I really love the first one, the whimsical tree. It’s fantastic! O boy! Forest people! What a cool topic and your imagination is running wild here. I loooove the first pair! Love the wonderful patterns and the sadness of the dogs!I am always a sucker for a good dog story:) Nice use of texture and pattern in your work! Love the three dogs! Such soulful expression in their eyes! It’s a joy to see these lovely puppys. They look so sweet. And the other 4 are so pretty to. Thanks for sharing. Glad so many appreciate your Art Work!! You know we do!! 1st time I’ve been able to send 2 comments for you! I know the fairytales and those were horrible dogs, real monsters. Your dogs are sweet as ever with their wet droopy eyes. I love them and I love your mom! I think you have used puppy dog eyes to seduce the viewer into… I don’t know where…but there should be a warning with these…Like: Puppy dog eyes can be dangerous..they may seduce you into…somewhere you didn’t think you where going to or a certain state of mind which you weren’t expecting. Do not drive after excessive puppy dog eyeing. If “eyes are the windows to the soul”, then these are dogs with a lot of heart! Very sensitive portraits…each with it’s own distinct personality…wonderful! The eyes are like wells of emotion. Very nice. I love your people of the forest Cindy!